When you’ve found “the one,” you want her to have her dream engagement ring. Look to Ritani for the perfect piece! Each setting is crafted by hand. 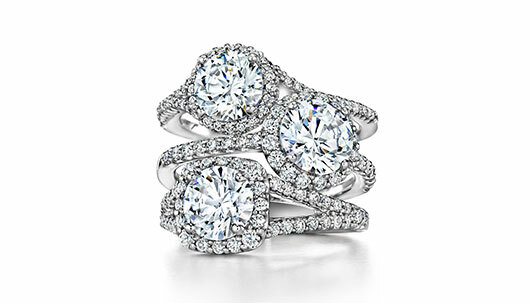 There are five styles to choose from: Solitaire, Classic, Halo, Three-stone and Masterwork. The solitaire setting features a single center stone. It is simple and understated. The Classic has smaller diamonds on the band. It has a timeless elegance. The Halo has a vintage charm, with small diamonds surrounding the larger center. Representing your past, present and future, the three-stone mounting has two side diamonds on either side of the center diamond. The Masterwork setting has an heirloom, a antique-inspired design that will take her breath away. Once you have selected the setting, pick your precious metal. Choices include platinum, palladium, white gold, yellow gold and rose gold. Then the piece is ready for your diamond! It really is that simple! Whatever shape diamond you have, the result will be stunning!